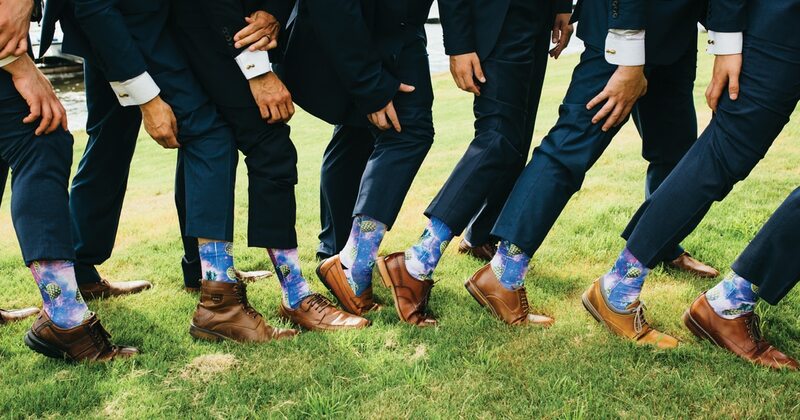 What you wear on your wedding day is a reflection of your own unique style – so it makes sense to put some thought into what you and your groomsmen are sporting on your special day. Trends come and go, but a groom’s style is his definitely his own, and it’s a perfect time to let that shine. Whether you lean toward the more casual look or are after a more classy style, here are a few trends that have surfaced on the wedding scene that may speak to you as you prepare for one of the most important days of your life. 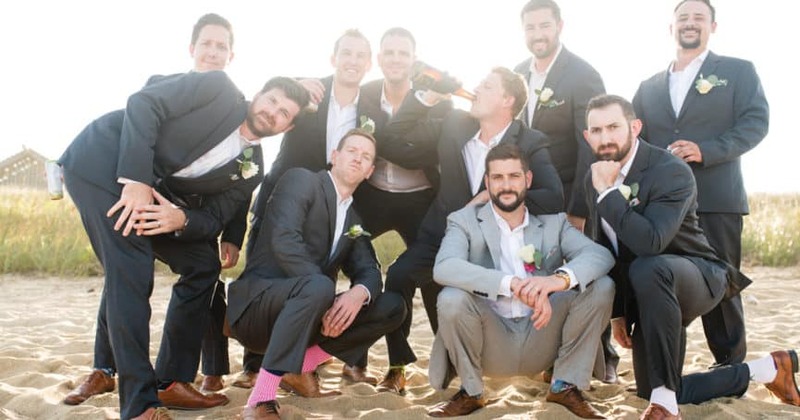 More and more, grooms and groomsmen are showing off their style with mismatched suits. While it’s always a good idea to follow the groom’s lead as far as style, that doesn’t mean that the groomsmen can’t change it up a bit, whether it means a mix of jackets, ties, or more. Even though experts suggest keeping suit color and fabric the same, there are plenty of opportunities to show your style by mixing it up a little bit! For an even more mixed up style, grooms are now leaning toward the casual by wearing shorts and a simple button down shirt for the big day. 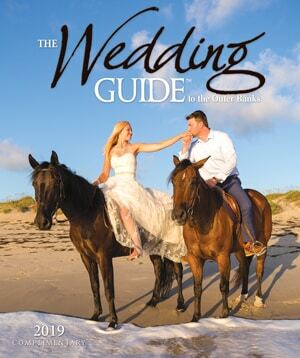 Not all weddings are designed or need to be to be elegant affairs, especially those with a beach setting. Consider beach attire for your beach wedding. What you wear around your neck on the big day can say a lot about your style. And today’s groom has plenty of choices, from the bowtie, necktie or no tie. If you go the tie route, be creative and choose one that says you. From floral designs and stripes, to checks and bold colorful designs, it adds the perfect touch to any groom’s attire. Ties not your style? 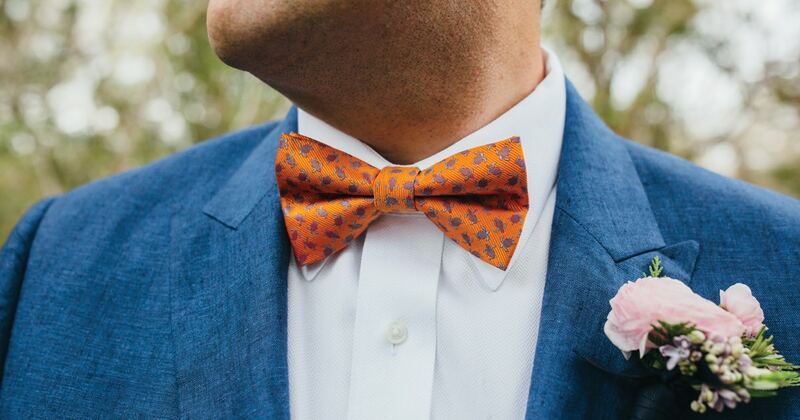 Classy, creative bowties are also making their way back onto the wedding scene. And don’t rule out the traditional neckties, which come in a variety of style and colors depending on the occasion and of course, your own personal style. Want to make a statement on your wedding day? A man’s socks (and shoes) can say a lot about him and his own personal style. Get creative about your socks – by either choosing colorful ones, patterned or even polka dot. Have a favorite super hero or sports team? Show it with your socks! And as for the shoes, remember anything goes depending on what look you are after. From the more traditional wingtip shoes to cowboy boots – let you feet do some of the talking on your wedding day. Suspenders are also back in style and can help grooms combine playful with elegance. Consider matching your suspenders with the accessories of the bride, or perhaps with her shoes or bouquet. And when it comes to choosing, there are thousands of styles in an array of fabrics so you’re bound to find one that fits your personality perfectly. 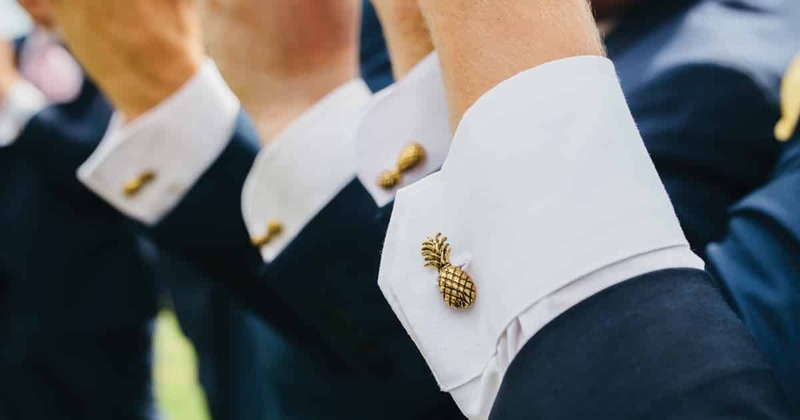 Grooms are sporting cufflinks these days not only to coordinate with their bride’s ring or dress, but also to share a touch of their personality. From elegant options like gemstones or diamond-studded, or to show off a hobby or even an alma mater, cufflinks are just another way for the grooms to share a piece of their personality on the wedding day. Many are also considering adding a splash of color with pocket squares, lapels and buttonholes.